Greg Wilson suggested that I try profiling a company like Adjuvant Informatics from Hamilton, ON. This is a market that I have only passing exposure to, and therefore the details of this analysis could be questionable. I’d be happy to publish the feedback from others with more knowledge in the space. The Adjuvant Informatics management team is made up of Dan Meyer, Dr. James Paul and Anders Elmik. Dan Meyer is the founder of Med-Tel Software. As of 2006, Med-Tel was reporting having 1,000 clients and continuing to grow. Mr. Meyer has a track record in providing successful clinic billing and reporting software. Dr. James Paul is an anaesthetist with a specialty in pain management. I’m not an expert in this market. Suffice to say there is a lot of money spent on pain management ranging from the costs of medications to the management and effectiveness of treatments. Healthcare as a whole is an increasing part of the developed world’s economy, consuming over 16% of the GDP in the US and estimated to grow beyond $3.3 trillion annually. The market for pain management medications in 2006 was estimated at approximately $26 billion per year and growing. The market is estimated to be growing at an annual rate of near 30%, and will reach $40 billion by 2010. However the medication market is just one piece of a complex pain management puzzle. Understanding the market requires understanding the medications, the hospital costs, the medical staff costs and the impact on the patient. In 1998, the average length of stay in hospitals for people who had surgery was 5.1 days and a greater than 160 million surgery-related days were spent in hospital. There is growing support that pre-operative risk management and post-operative pain control is thought to result in more efficient use of health resources, decrease overall costs and increase patient quality of life by reducing the chances of acute pain becoming chronic. Adjuvant Informatics builds tools to help clinicians and hospital administrators manage information related to patient pain. The product suite aims to provide standardized data capture and analysis tools for hospitals that take in patients scheduled for the operating room. The tools gather information to assist in research into patient risk analysis. Coupled with the platform for each hospital, Adjuvant Informatics is building a centralized data store for clinical anaesthesia “allowing hospitals to make comparisons between their own patient outcomes – such as side effects and length of stay” with those of other hospitals. The centralized data store is being used in conjunction with Cardinal Health to provide data to patient’s drug-administering pump infusion devices to management the distribution of pain treatments and their effectiveness. The goal of the product is to “make the use and tracking of pain medicine more accessible to hospital staff and hospital systems”. Adjuvant’s products allow hospitals to do systematic reviews of patient outcomes, of critical incidents, of cost management related to giving medicinal narcotics to patients. The market for health care solutions seems to have 2 main market opportunities: cost-reduction or safety-increasing. Basically, does the solution reduce the costs of the care provided or does the solution increase patient safety or the quality of patient care. Adjuvant Informatics sells an enterprise software solution to hospitals to help them manage their patient pain information. The solution includes a suite (read menu) of software applications including Pre-Op Clinic, APS Manager, and offers hardware and software solutions for bedside data entry. The business model is either a subscription model for software or a more traditional enterprise software license plus annual support contract. It appears that customers come through focused conference attendance including: Canadian Anesthesia Society Annual Meeting; British Pain Society Annual Scientific Meeting; American Pain Society, etc. Targeted lead generation focusing on anaesthesiologists and pain management professionals. Then a standard enterprise/institutional sales practice that follows up after interest and demand is generated at events. Cardinal Health – Integration of APS Manager software suite with Alaris Gateway suite provides access to networked pain medication devices that provide medication delivery for 1.5 million patients annually. And generates more than $2.7 billion in annual revenue for Cardinal Health. University Health Network – Co-development of a new preoperative assessment module in partnership with Dr. Scott Beattie of the University Health Network. Relationships with key hospitals, like UHN, for product development and deployments are a great way to ensure functionality , usability and compliance. The strategic partnership with Cardinal Health allows access to a manufacturer and distributor of healthcare devices that allows for integration in existing hospitals and health maintenance organizations. There are direct competitors in pain management software including Pain Associates International Network. However there is larger competition in traditional electronic medical records software providers. This is because the majority of the data gets captured by these tools today. Extending these systems to include pain management risk assessment criteria could put the Adjuvant Informatics solution at risk. However, the aggregated data in the ICAD solution offers an opportunity to perform robust cross facility analysis of risk factors and successes. There is an opportunity to build connectors to import data from the larger EMR companies. There is a growing category of new providers in the space including Microsoft Health Vault and Google Health which provide SaaS solutions for capturing and maintaining consumer health records. Healthcare is a highly regulated space with concerns around patient safety, privacy, legal status, interoperability, future proofing, among other legislative and regulatory guidelines. Having a management team and company familiar with the process and an approach for approval is a huge advantage for Adjuvant Informatics. There are also a ton of standards for electronic medical records including HL7, ANSI X12, HISA and others. 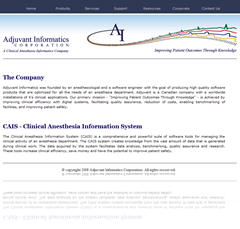 Founded by an anaesthesiologist and a software developer, Adjuvant Informatics has a built a suite of tools for managing the clinical activity of the anaesthesia departments of hospitals. The in clinic experience and understanding of the practitioner’s concerns, coupled with a deep experience building billing software with Medtel Software should provide Adjuvant Informatics significant head start momentum. This coupled with further research into the actual size of the market, i.e., finding numbers about either the effectiveness of the solution for reducing patient costs or reducing patient risks are necessary. This will help determine if the model is to sell the solution to clinicians or hospital administrators, or insurance companies. It is unclear to me from looking at the publicly available information who has the largest financial pain or the great power in choosing the solution. It seems that there is still some work to be done in defining the revenue sources in order to find funding. So far, Meyer estimated, Adjuvant has chewed up $400,000 in capital "with no real revenue stream yet. "Clients are just starting to trickle in. Our goal is to become the standard, like Windows, and we have a chance of doing that, but there’s also a real potential of not making our goals," he said, adding the company is talking to angel investors, banks and other sources. "With $1 million we could finance a very aggressive assault on the U.S. market," he said. "Until then, we have to be very tactical in how we market."